The Stena Superfast VII ferry operates between Northern Ireland and Scotland. The vessel disappeared in November 2017 with 44 crewmen aboard. Denmark is braced for the trial and the story of murder on a submarine after a journalist's body parts were found on the seabed. The Argentine navy announced that a sound thought to be an explosion had been detected by US and specialist agencies leading the search. 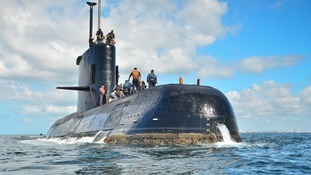 The ARA San Juan disappeared on November 15, en route from Ushuaia to Mar del Plata. The wreckage of the long-lost British submarine thought to have sunk 74 years ago has been found off the coast of Sardinia, reports claim. US officials claim the secretive state lost contact with the submarine - which is now thought to have sunk. Three officers have made maritime history by becoming the first female submariners to serve in the Royal Navy. Lieutenants Maxine Stiles, Alexandra Olsson and Penny Thackray have completed months of specialised training to earn their "Dolphins" - the clasp worn by qualified submariners - becoming the first women in the 110-year history of the Navy's Submarine Service. For years women were unable to serve on submarines because of possible health risks but, after an independent review found that only pregnant women should not serve, Defence Secretary Philip Hammond lifted the ban in December 2011. Following the arrival of woman officers, female ratings (non-commissioned personnel) will start training later this year with a view to serving on Vanguard submarines in 2015. Female personnel will also be able to serve on Astute-class submarines from around 2016.